Every business is told they need to build an email list from the get-go. 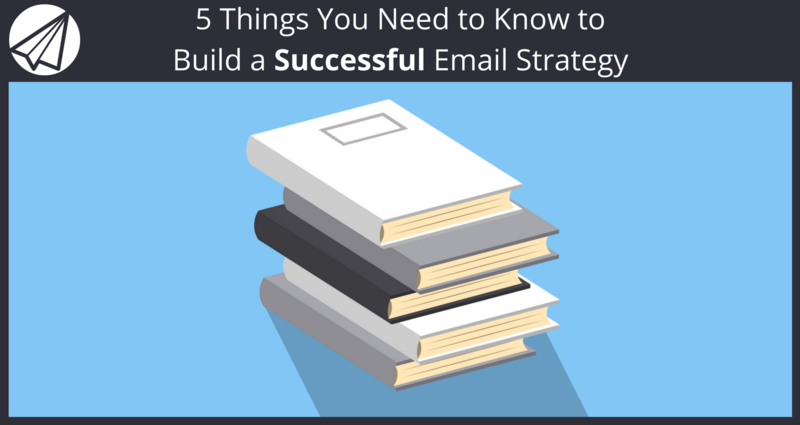 If you don’t have a successful email strategy, it’s easy to fall flat and create a stagnant list. A stagnant list does not respond to what you have to say. Instead of a large list, building an engaged list is the way to go. In an engaged list, you nurture a community of loyal fans who eagerly await everything you have to offer. When you consider that email marketing drives more conversions that any other marketing channel and that, according to McKinsey, email is 40 times more effective at acquiring new customers than social media, it’s easy to see how important it is. But where do you even begin building a list that’s this successful and that ticks all the boxes? It all starts with a successful strategy. The very first building block in a successful strategy is knowing who your audience really is. Without that knowledge, you won’t know what to send them, what they need, and how you can help them. Before you even consider drafting and email sequence (something you can easily do with Sendlane), or putting together your strategy, you need to figure out exactly who you’re talking to. In order to know what problems they need solutions for, you need to dig deeper than that. Think about what their biggest daily struggle is, how they spend their spare time, and what they’d like their life to look like. Once you have an idea of who it is you’re speaking directly to, you can connect with them on a personal level and start creating really strong relationships with your readers. A successful email strategy isn’t a one hit wonder. It’s not a case of hitting send on sporadic emails whenever you have something to say. Your subscribers signed up for a reason, so they’re actively expecting to hear from you. If you only drop into their inboxes every blue moon with a new product, you’ll slip their mind and they’ll start thinking you’re only interested in them for a quick sale – which absolutely isn’t the case, right? Instead, you want to nurture them from the moment they sign up, sending them regular emails at times that suit them. You can easily test this out by experimenting with the times you send your emailsand measuring the open rates and click-through rates at certain times. For example, if you’re in the UK and sending out your emails in the morning but the majority of your subscribers are American, they’re going to be receiving your lovingly crafted messages when they’re asleep. Once you’ve figured out who exactly you’ll be speaking to via your emails and how frequently you want to be reaching out to them, it’s time to start thinking about the actual content of your emails. To really nail down your strategy and make it successful from the start, it’s time to start thinking about goals – or, more specifically, what you want your emails to achieve for your business and your subscribers. Having specific goals in mind will help focus your strategy and ensure your subscribers get a solid outcome from reading them – a key aspect of building a loyal and engaged list. 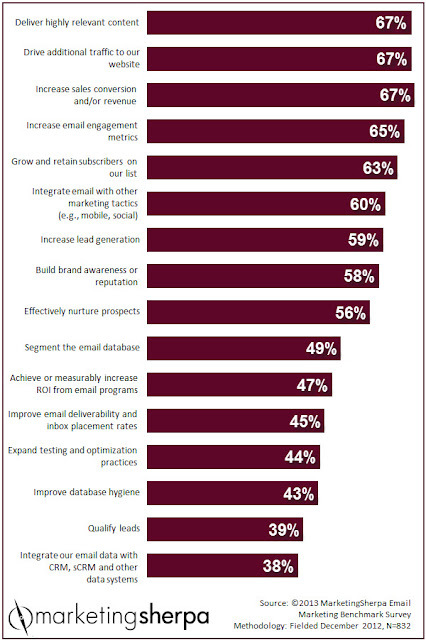 A list showing the goals of email marketing for a number of businesses. The problem with a lot of email marketing strategies is they are simply a series of one-off emails sent one after the other with no real link that joins them together. As humans, we love a good story, especially one that we can relate to and connect with. It’s just human nature, which is why it’s worth tapping into this with your strategy. An example of a story that stirs the subscriber’s imagination from Orbitz. You don’t necessarily have to craft an epic tale about your business. Instead, you want to make sure your strategy has a relatable beginning, middle, and end, and that there’s a narrative or plot that runs through each email. This creates a sense of cohesion and gives your subscribers a familiar structure that they’re used to seeing every day. Now, it’s all well and good having a great email marketing strategy all setup and ready to go. But what is it worth if you don’t have any subscribers to send it out to? If no one is signing up for your great automated sequence, it is a complete waste. Think about what your target subscribers struggle with and how you can best help them off the bat. For example, if it’s something they need urgent help with, maybe a lead magnet would be the best bet. A lead magnet is something that they can download instantly and get started with. Building a successful email strategy boils down to knowing your target and what you want to help them with. Once you know this, you can start building out your emails, linking them together with a relatable story, and putting together a promotion strategy that will reach the right people and show them why your list is one they need to be a part of. Ready to turn that stagnant list into a thriving, successful one that generates sales and builds a loyal tribe? If so, the last step you need is a top notch autoresponder software to organize and deliver your marketing campaign. Lucky for you, Sendlane™ is offering a free trial of our email marketing software right now! 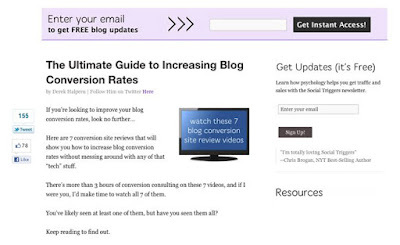 Have you used any of the keys mentioned in this article to build your email marketing strategy? What has worked well for you, and what has been problematic? Feel free to share in the comments below! We appreciate you reading our new posts here every Monday and Friday! If you found this post helpful, chances are your friends will enjoy it too. Please help us spread the word by liking and sharing this post on Facebook, Twitter, LinkedIn, and your other Social Networks using the buttons at the bottom of this post. We appreciate it.